Germany is a beautiful country and also has a global presence. Its economy is the wealthiest in Europe and also enjoys the fifth largest spot in the world. Moreover, it offers free education to local residents and supports a strong market for jobs (Germany Job Seeker Visa). There is a wide prevalence of high-paying positions in several industries. It is an appealing country for living and working. Moreover, it attracts the attention of youths and skilled professionals from across the world. We present all the relevant facts regarding Germany job seeker visa here. Germany has a flourishing economy but also has a shortage of skilled workers in various sectors/industries. There is a huge demand for technical professionals, engineers, IT specialists, and Health Specialists. A job seeker visa permits a stay in Germany for six months and the person can look for a job by using the Long-Term Residency Permit. This visa immediately does not give a license to work. It is a short-term permit entitling a person to visit the country and search a job in six months. After ending of six months, you get a Germany Work Visa or a Permit in case you get a job successfully. This grants protection to live because you work in the country. In case of failure returning to the country of origin is the only option. After confirming eligibility, prepare these documents and attach them to the application. There must be a checklist for avoiding rejection of the application. Please secure all of them before you apply. Back up plans if job search is unsuccessful. Diploma/degree or proof of academic qualification besides certificates from previous work experience. Fill up the form for visa provided by German Embassy. Moreover, after submitting the form, you are put on a schedule for an interview. 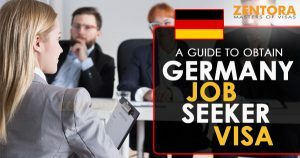 The possibility to get a Germany job seeker visa depends on your documents, background, application form, and facing the interview. Also, prepare for a comprehensive application, the 7% unemployment rate in Germany assures several opportunities for progress and career growth.